This artist’s impression shows the disc around the young star T Cha. Using ESO’s Very Large Telescope this disc has been found to be in two parts, a narrow ring close to the star and the remainder of the disc material much further out. A companion object, seen in the foreground, has been detected in the gap in the disc that may be either a brown dwarf or a large planet. The inner dust disc is lost in the glare of the star on this picture. 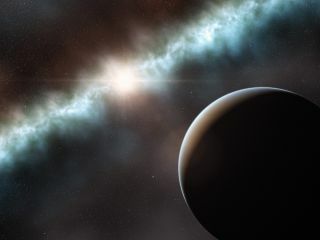 Researchers may have spotted a new alien planet coalescing out of the dusty disk surrounding a young star — an observation that, if confirmed, would be a cosmic first. The international team of astronomers was studying the disk of dust and gas around a nearby star called T Chamaeleontis (T Cha for short) when it made the potential find. This disk has a large gap, and in two new studies the researchers report the likely cause: a companion object, one that could be a newly born alien planet. If this turns out to be the case, it would be the first time a coalescing planet has been detected in such a young disk, researchers said. "To our knowledge, this is the first time we have a fairly complete picture of a peculiar system like this, on different spatial scales, from the innermost regions to the detection of a companion within the gap," said Nuria Huelamo of the European Space Astronomy Center's Astrobiology Center in Spain, lead author of one of the studies. T Cha is a relatively faint star found in the southern constellation Chamaeleon, about 350 light-years from Earth. The star is like our own sun in a number of ways, researchers said, but it is just 7 million years old or so, compared to the sun's age of 4.5 billion years. T Cha is so young that a disk of gas and dust — the stuff that planets are made of — still hugs it. The researchers used the European Southern Observatory's Very Large Telescope, on a mountaintop in northern Chile, to study and characterize the disk and its prominent gap. The astronomers found that a narrow dusty ring sits about 12.4 million miles (20 million kilometers) from T Cha. Beyond this ring, the gap — a region devoid of dust and gas — stretches out to about 680 million miles (1.1 billion km) from the star. "For us, the gap in the dust disk around T Cha was a smoking gun, and we asked ourselves: Could we be witnessing a companion digging a gap inside its protoplanetary disk?" Huelamo said in a statement. This visible-light wide-field image of the region around the young star T Cha was created from photographs taken through red and blue filters and forming part of the Digitized Sky Survey 2. The star appears close to the centre. Some of the dust associated with this star-forming region is faintly visible in the background, particularly at the upper left. Careful observation and analysis confirmed the researchers' suspicions. They picked up a clear signature of an object sitting in the disk's gap, about 620 million miles (1 billion km) from T Cha — a little farther out than Jupiter is within our own solar system. The object is much smaller than T Cha, though researchers said they aren't yet able to pin down its precise size. The object may be a planet, or it may be a brown dwarf — a curious body that falls between planets and stars in temperature and mass. It's too soon to tell, researchers said. The team plans to observe the object again in a month, at which time things could start to get a little clearer. Either way, the find marks the first time a body like this has been discovered in such a young protoplanetary disk. "We plan to obtain observations in different filters, which will hopefully help us to understand the nature of the object," said Johan Olofsson of the Max Planck Institute for Astronomy in Heidelberg, Germany, lead author of the second study. Both papers are being published by the journal Astronomy & Astrophysics. Whatever the newly discovered object turns out to be, such finds could help astronomers improve their planet-formation models. In the meantime, Huelamo and Olofsson said, these models need to be pushed further — to simulate how quickly disk gaps such as T Cha's open up and how the mass and orbital characteristics of companion bodies affect them, for example. In the very near future, Olofsson said, "we will be able to test all these questions, and we can hope to understand more and more about planet formation."